High quality extruded PVC T-molding for office furniture. Solid color throughout. We can also help you develop any custom profile needed. 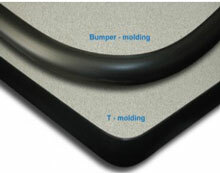 Newer profiles like our Ripple and Wedge T-molding can help give your project the edge to stay ahead. Sold in Rolls / Boxes Only. Haworth® shelf end gaskets. Extruded Dual Durameter PVC gaskets. Cut-to-size. Pre-colored, no painting necessary. Ends are punched for easy installation of shelf end T-molding. High quality mar resistant rigid Herman Miller® PVC Power Poles. Designed to be used with AO1 systems. Herman Miller® Filler Strips. High quality extruded PVC plastic. Now with peel & stick backer. Steelcase® Movable Wall Rails. Extruded PVC plastic fits snugly over existing metal rails or can be used in placed of rails. Eliminates the need for filing and repairing. Part# 4859 has perforated punchout. Colors: Putty and Grey. Can be painted to match your color needs. Steelcase® panel hinges. Extruded PVC with UL Listed Polypropylene resins. Pre-cut to 371/4", 481/4", 601/4"and 701/4" lengths to fit 42", 53",65" and 75"panels respectively. No trimming necessary. Steelcase® Slot Cover Reveal for 9000 series panels. Designed to cover hardware between upright and panel blank. Colors: Black, Grey Value 1 & Warm Brown 2.